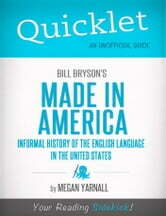 Made in America is Bill Bryson’s account of America’s history through linguistic development - and linguistic development through history. 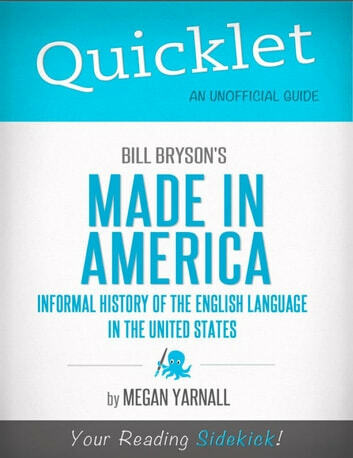 His account of America’s birth and growth demonstrates the timeline of Americanisms, American phrases, and the melting pot that made American English distinctive among dialects. Bryson also explores regional dialects and how they came to exist via immigration and dispersion across the country. Published in 1998 by Black Swan, Made in America incidentally showcases the path of American culture as it catalogues history and language. History, language, and culture are all wrapped into one because they are so tightly connected to each other, and Bryson can’t avoid giving an account of all three as he gives an account of language. Made in America begins with the Mayflower voyage and travels all the way to present day modern America, accounting for the totality of America’s timeline. Every chapter consists of a historical account of America during a specific time period, and then moves into the familiar language of that day, from where the phrases came, and how they survive in modern day English after evolving from their roots. Megan Yarnall is a publicist and writer from Bucks County, Pennsylvania. She studied English, creative writing, and Italian at Dickinson College, and wrote her thesis on the connections between humans, their bodies, and language. She graduated in 2010 after spending four years organizing all of her college’s concerts. Megan has lived abroad in Italy and loves studying foreign language, linguistics, and writing. The invention of the airplane and then commercial flying gave rise to the word stewardess and then jet lag as well as jumbo jet. The 1950s saw the start of technological innovation, and it seemed that invention was the driving force behind linguistic development and the introduction of new terms than were immigration, cultural differences or America’s melting pot. Language reflects culture and history because culture and history are its roots. At one time, America’s culture was based on immigration and the integration of a variety of cultures on one land, and that fueled linguistic development. When America as a country transitioned into modern times and became more based on a single American identity and technology, the new identity and tech space began to fuel our language with developments such as laptop, hacker, and software. Biography of Georgia O'Keeffe: The life and times of Georgia O'Keefe, in one convenient little book. Decisions Greatest Quotes - Quick, Short, Medium Or Long Quotes. Find The Perfect Decisions Quotations For All Occasions - Spicing Up Letters, Speeches, And Everyday Conversations. Growing Up Greatest Quotes - Quick, Short, Medium Or Long Quotes. Find The Perfect Growing Up Quotations For All Occasions - Spicing Up Letters, Speeches, And Everyday Conversations.